My dedication for polo began a decade ago when I was introduced to my mentor, Enrique Diaz. 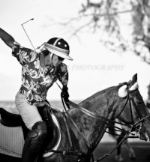 Originally from Argentina, Enrique brought a unique passion for polo to Hawaii. He played professional polo around the world before settling in Hawaii and sharing his knowledge to students through a UH Manoa polo program. I was one of those lucky students and he taught me everything I know. Enrique's background in polo could be written as book. He started as a kid from the bottom rankings grooming in Palermo, rubbing shoulders with Cambiasso and the likes of other professionals. He traveled to England and got to live on the grounds of the Queen, playing with the Princes and then went on to become an instructor at Oxford University. His skills were appreciated by many and eventually he found himself in Wellington, FL where he became the polo professional for Gullian Johnston of Coca-Cola. Enrique's wanderlust then sent him west to the shores of California to play in Indio and Santa Barbara and also became the coach for the Stanford Polo team. While in California, he caught the eye of a well known polo family on Maui and eventually moved to the islands to play for the Baldwins. Hawaii got him hooked and he jumped on the opportunity to explore all the polo Hawaii had to offer, from the Maui Polo Club on the slopes of Haleakala to the sandy beach front field of the Hawaii Polo Club. Here Enrique found his roots and settled down to inspire many people, young and old, to pursue the passion that is polo. After 15 years of enjoying Hawaii as his home, Argentina came calling. He now lives on his own Estancia outside of Buenos Aires. Hawaii Polo Academy, LLC opened three years ago after Enrique Diaz left Oahu to further his dream to build a polo field in his homeland of Argentina. Diaz gifted me, his most loyal student with two horses on his departure and I've slowly grown my herd as the years went on. I've traveled across the state to play in tournaments on Maui and Hawaii Island, even spending a season with my horses at Mauna Kea Polo Club and Maui Polo Club to play. I started Hawaii Polo Academy in 2015 at the Honolulu Polo Club on the east side of the island and left to return back to the beauty of the North Shore where it all started for me. Now, based out of Dillingham Ranch, my school has two instructors for riding or polo lessons and six horses. The polo season is from March-September where clients can participate in club practices and games to further their polo skills. Off Season is a great time to hone in your polo techniques and practice polo style riding. It takes a lot of energy, time and discipline, but the outcome is quite worth it. Book a lesson today and see for yourself the powerful feeling that only polo provides.